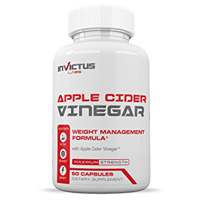 Invictus Labs Apple Cider Vinegar is a weight management formula produced by Invictus Labs and sold through Amazon. It is a maximum strength formula that has been created to help with detox, balance and energy. According to the official product sales page on Amazon, this apple cider vinegar supplement has been formulated to enhance lifestyle changes. It can target a variety of ailments. Among these include acid reflux, high blood pressure, sore throat, acne, skin, hair, circulation, common cold, dry skin, balanced PH levels, digestion, weight loss and so on. Every serving (2 veggie capsules) of Invictus Labs Apple Cider Vinegar, contains 1300 mg of Apple Cider Vinegar. There are 30 capsules per container and users are directed to take 1 capsule twice per day. For optimal results, users are instructed to take each capsule 20 – 30 minutes prior to meals or as directed by their healthcare professional. Right away, one of the benefits of this dietary supplement is that it contains only apple cider vinegar as its active ingredient. This does help to ensure that you are receiving the best dose of this ingredient. Moreover, there are no preservatives, artificial ingredients, chemicals or sugars. Apple cider vinegar contains acetic acid and other nutrients like vitamin C and B vitamins. It may help to lower blood sugar levels in people with diabetes by altering how food is absorbed from the gut. It may also prevent the breakdown of certain foods. All that being said, however, just how does apple cider vinegar benefit weight loss? It is believed that acetic acid can help with body fat reduction. In a study involving mice, those that were given acetic acid had higher energy expenditure and oxygen intake and burned more energy and fat than the mice who didn’t take it. In addition to helping to reduce body fat it may also help to provide feelings of fullness by lowing blood sugar. Unfortunately, the claim that apple cider vinegar can aid with weight loss is lacking evidence. Much more research needs to be conducted before this can be determined. That said, be advised that due to its ability to lower blood sugar, individuals with diabetes should speak with their healthcare professional before taking Invictus Labs Apple Cider Vinegar. Pregnant or nursing women as well as individuals taking medications or with known health conditions should also consult with their doctor prior to taking this dietary supplement.